Kewpie dolls were first manufactured in 1912, modeled after comic strip characters drawn by Rose O'Neil starting in 1909. The cartoon characters were baby "Cupid" figures, and the word "Kewpie" is a variation of "Cupid." The dolls quickly became very popular in the early 20th century, and a variety of the dolls were manufactured by several different companies into the present day, using a variety of materials. The most prized dolls for collectors are the early versions constructed from bisque, a form of porcelain. Those signed by Rose O'Neil are especially valuable. Later dolls were constructed from a material called composition—a combination of sawdust, resins, and other materials—and from celluloid. As the 1950s approached, soft vinyl came into use for the Kewpie dolls, and in recent years some manufacturers have returned to fine porcelain for limited edition models. 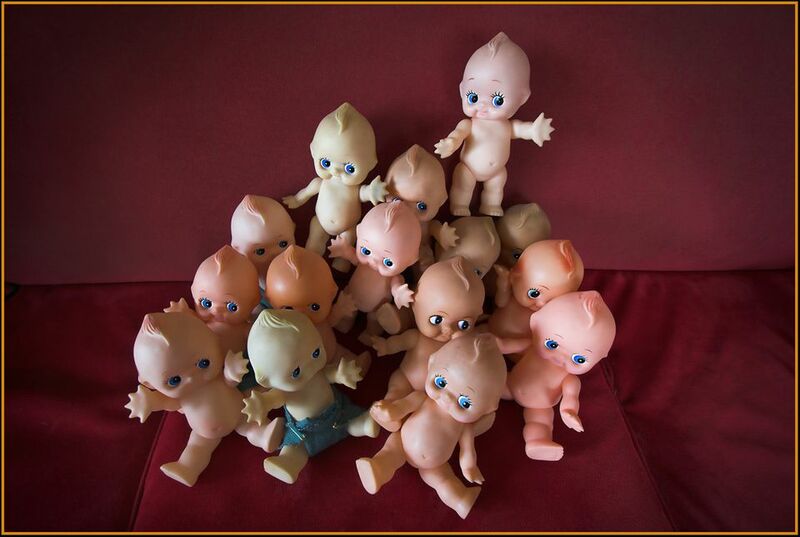 These are some examples of Kewpie dolls, from the first Rose O'Neill antique bisque Kewpies all the way through to modern Kewpie dolls currently being produced by Charisma Dolls Company. Prices are taken from internet and dealer sales figures. This Kewpie had damage on the tip of the broom. Note the original paper label on side of Kewpie. Its estimated value is $300 to $400. In the collectibles market, Kewpies that are holding items or are in action poses sell for higher prices than Kewpies in the classic standing pose. This bisque model features two Kewpies in an embrace and was designed by Rose O'Neil. Value of this model ranges from $175 to $300. This pair carries maximum value if it has original labels and bisque that is in perfect condition. This pair of antique bisque Kewpies is sometimes referred to as "The Lawyers." The set stands approximately 3 1/2 inches tall (it was made in a larger size as well). It is from the first line of Kewpies made fro Borgfeldt company. This pair is particularly valuable because it features dolls in action, not merely standing. Value of this set is $400 to $500. This back view shows a second book, as well as the original Rose O'Neill copyright sticker. The Kewpie doll was created by Rose O'Neill and is based on her original illustrations that first appeared in the Ladies Home Journal in 1909. Value of this doll is between $199 and $299; the higher range is commanded by dolls with original paper labels, and if the bisque and paint are in perfect condition. All classic Kewpie dolls have a little pair of molded blue wings on the back. This back view shows those wings. This doll is nearly nine inches tall and is a later generation of Kewpie made from celluloid. Although it is not in the classic generation of Kewpies, this doll is valued at roughly $100, since a large celluloid doll in this kind of good condition is rare. Celluloid is a fragile material, and dolls in perfect condition have higher collectible value. In this close-up, the excellent condition of the celluloid and finish is clearly evident. Cameo company was originally a partner with Rose O'Neil in the 1920s and continued to make Kewpie dolls after her death in the 1940s. They also licensed other companies to make the dolls, such as this plush Kuddle Kewpie made by Knickerbocker company—which at the time was most famous as the maker of Raggedy Ann and Andy dolls. Featuring a molded vinyl face and plush body, which likely means the doll was produced in the 1950s or 1960s. This doll is valued at $50 to $125. In this close-up view, you can see the soft vinyl face in excellent condition, as well as the characteristic impish smile and sideways glance that is the hallmark of Kewpie dolls. Vinyl Kewpies like this were common in the 1970s. They were inexpensive to purchase then and are still inexpensive today. It is approximately 12 inches in height. This doll sells for about $10. Charisma Dolls currently makes vinyl Kewpies and has done so for several years. This vinyl Kewpie is 9 inches tall. Charisma Brands has its roots in the LL Knickerbocker company, a company most famous for its line of porcelain Marie Osmond dolls. After a bankruptcy and sale of its assets, it became Charisma Brands in 2004. This doll sells new at retail for $29.95. This larger (15-inch ) Kewpie doll and Doodledog is made in fine porcelain by Charisma Dolls. This pair marked the first time in over 75 years that Kewpie and Doodledog were produced as a pair. Retail price of this doll is $129.99.